Two days of Optimus Prime in a row! Is there a better way to bookend a weekend? I think not. 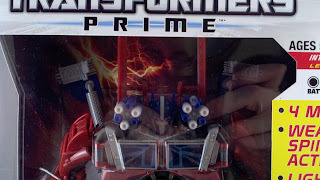 Today we're going to take a look at a figure that I was really on the fence about buying, the Transformers Prime - Weaponizer Optimus Prime. 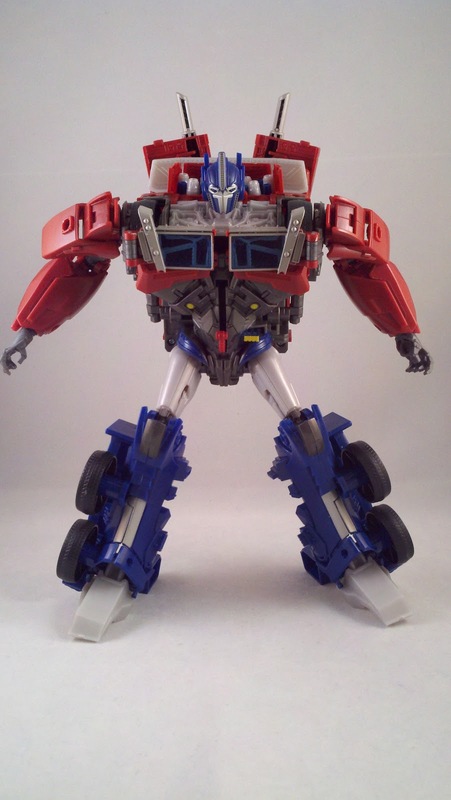 It's really tough for me to pass up any version of Optimus Prime that I can get my hands on with little effort and without breaking my wallet. This figure tested that and one reason put me over the edge. 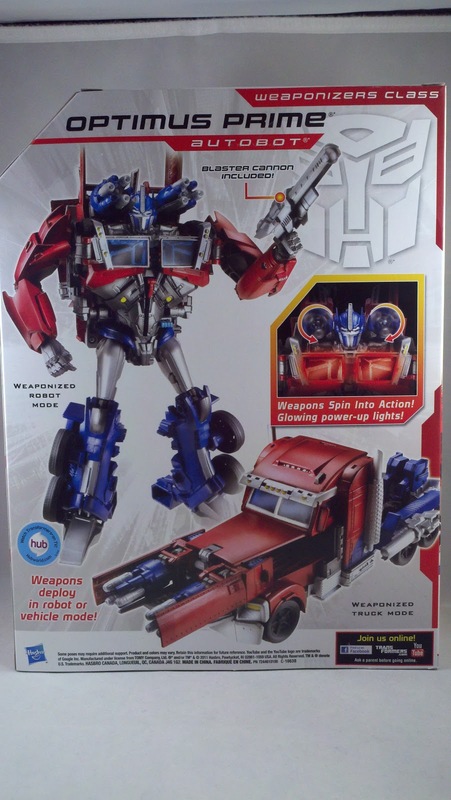 Take a look at Optimus in all is firepower wielding glory and judge if you think he's shootin' straight, or shootin' blanks after the jump. 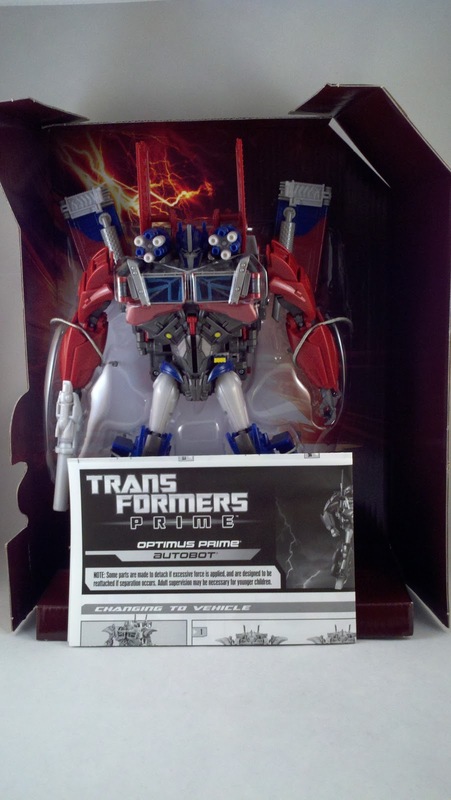 Another new Optimus Prime from the Transformers Prime universe. Hey, I'm all for it... what I'm not a fan of is odd gimmicks. Truthfully, I've been on the fence on this figure for some time. 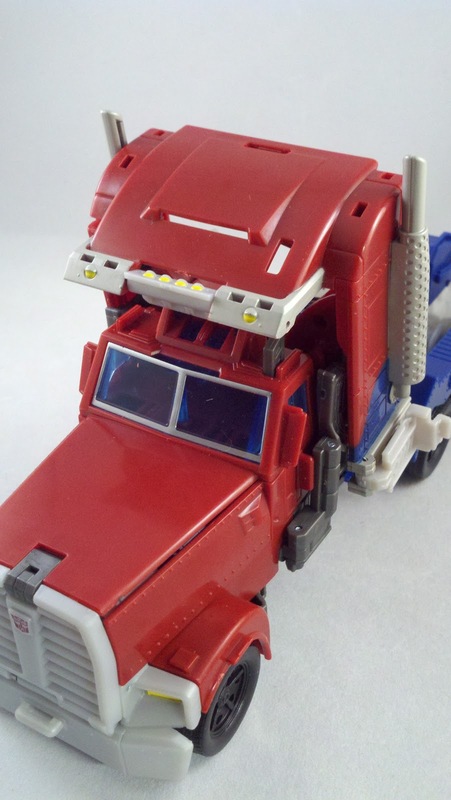 It's an Optimus, but it's a gimmick Optimus Prime. 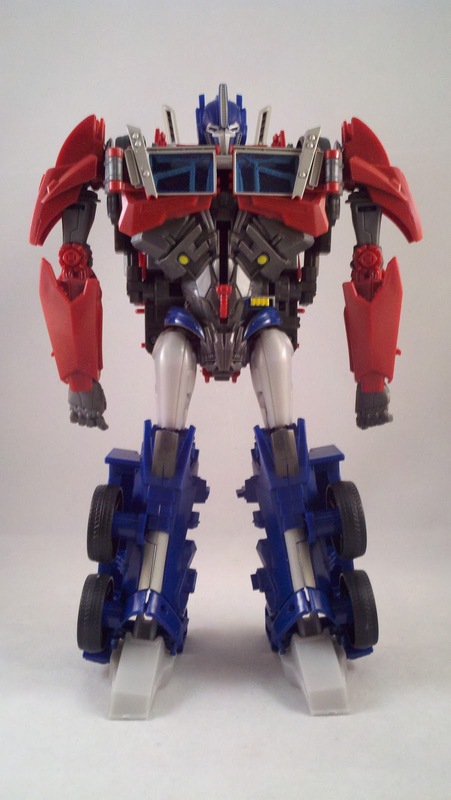 The gimmick isn't the only thing that had me worried, this Optimus is ridiculously out of scale with the rest of my Prime figures. 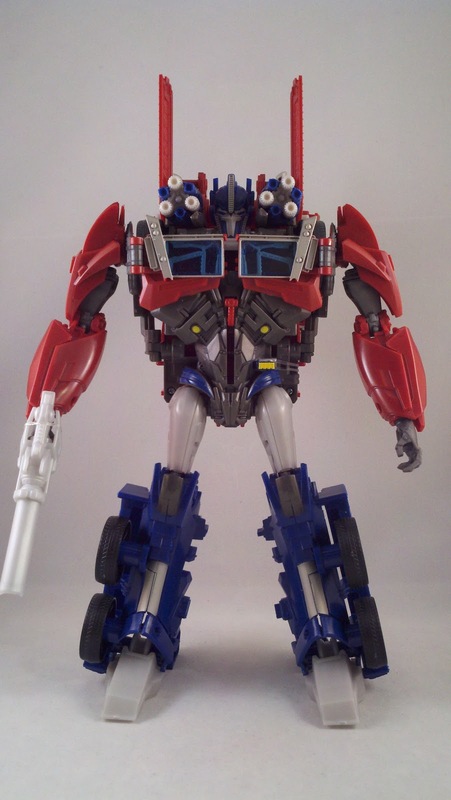 Who, admittedly may be a mash up of Voyager and Deluxe molds, but this Optimus is just too big; he would definitely just be a display Optimus to go with the rest of my Optimus collection. Which is also fine. The final straw that kept me from purchasing him was the price; $32.99 in most areas. I kept waffling on buying him until a trip to Toys R Us; Optimus was on the shelf for $10 off. A $22 near Leader scale figure? I can do that. 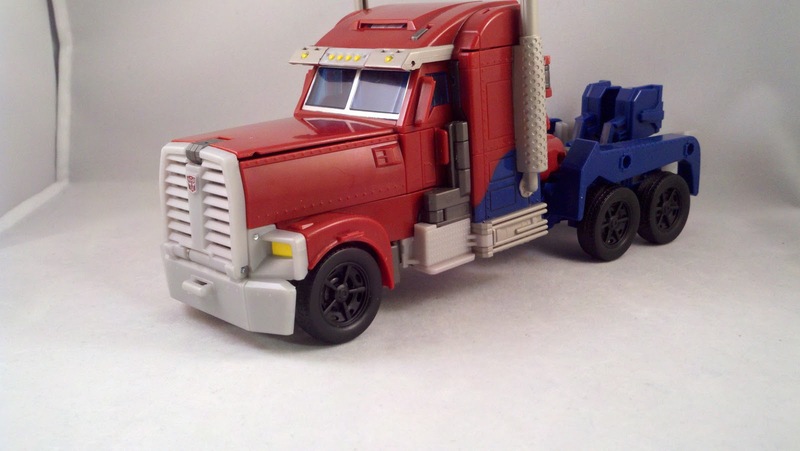 So I plopped down my $25 after tax and walked out with another Optimus. 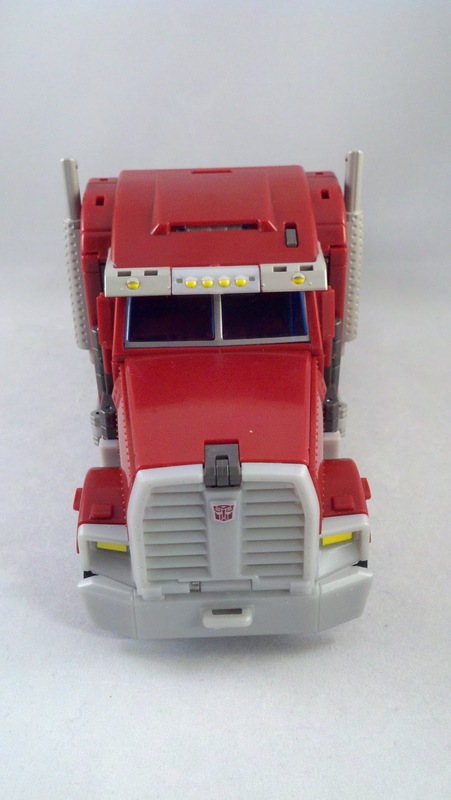 Weaponizer Optimus Prime comes packed in the standard TF:Prime packaging, a white with red window box. 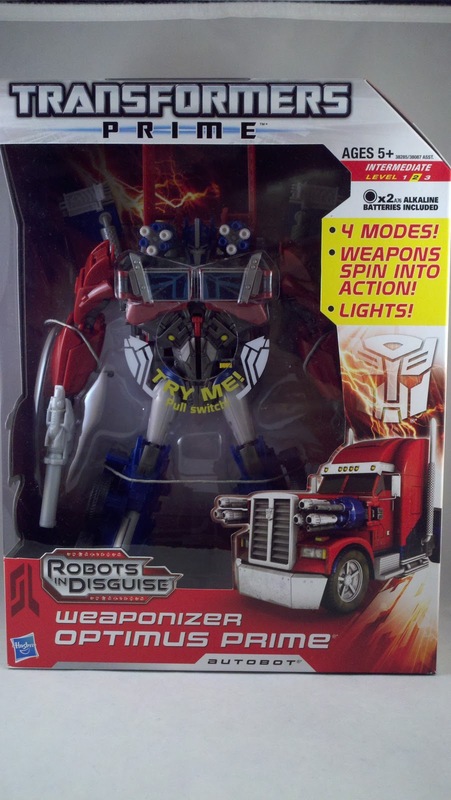 The front shows off some art of Optimus in his Alt-mode with his Weaponizer cannons deployed, while the window has a cut-out that allows you to test out his Weaponizer gimmick. 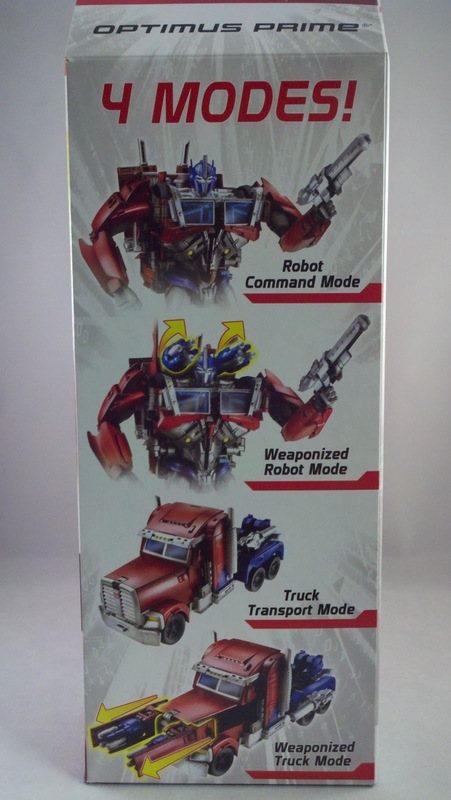 One side of the box shows Optimus in his "4" modes; standard Bot and Alt modes and Weaponizer Bot and Alt modes. Same Bot and Alt, just with extra weapons. I really wouldn't consider that 4 modes. 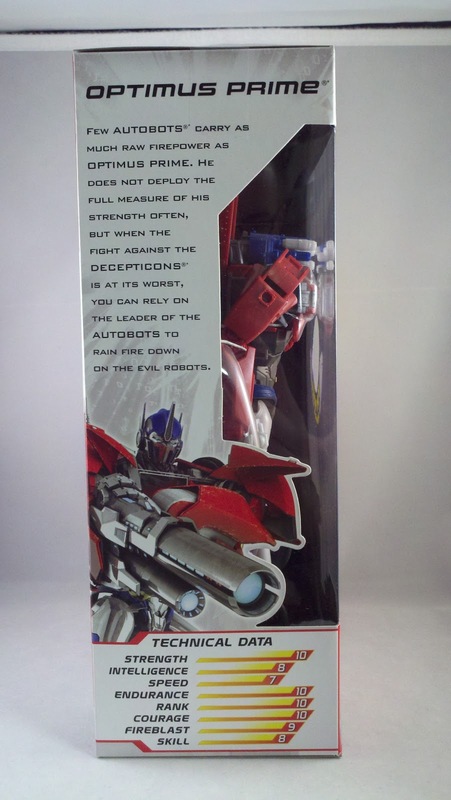 The back of the box shows OPtimus in both Bot and Alt modes with his Weaponizer cannons out. 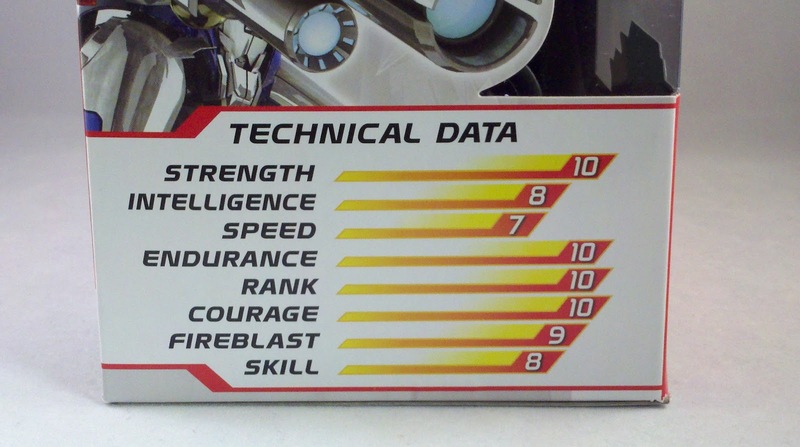 The last side gives us Optimus's bio and Tech-Spec. Open the box and we have our standard plastic in card tray with paper ties and instructions underneath. Out of the package first impression... I'm worried that the Weaponizer cannons don't stay down. He's got a good weight to him... he doesn't feel to flimsy, but his lower legs look really hollow. 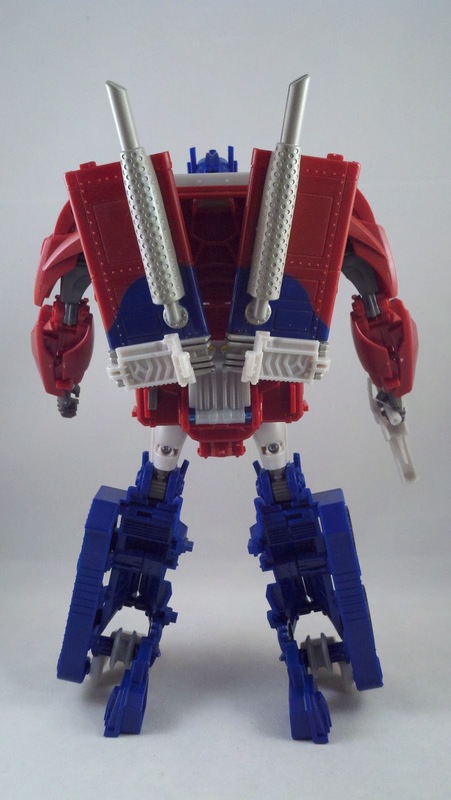 Before I got into transforming him, I played around with the Weaponizer gimmick. While in the box, the canons do NOT stay down and remain deployed. While playing with them, I could get them to stay down, but any jostling and they'd deploy again. 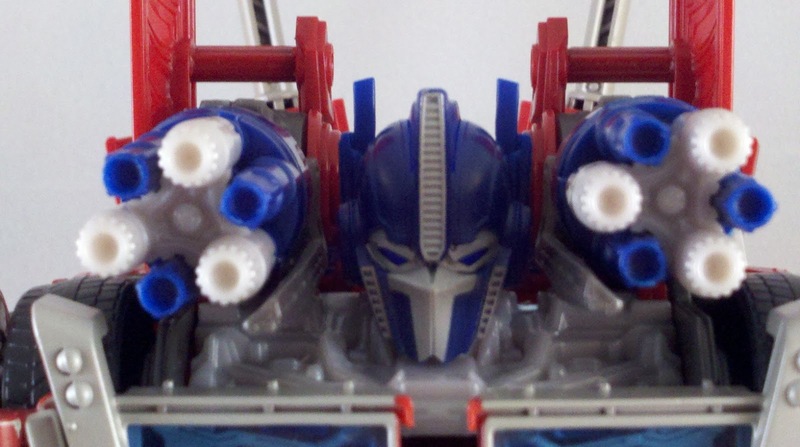 I was a little disturbed by this; why show it's ability to have multiple modes if the canons ALWAYS stay out. 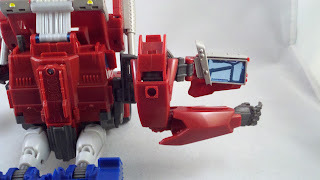 After getting Optimus out of the package, I noticed a clear band that was hooked to a yellow and blue lever near the red lever that withdraws his canons. I removed the band and sure enough, it's the activator switch for his cannons that keeps them stowed away. Pull the red lever down and they stay down. Push the yellow and blue lever to the right and the canons deploy. I was much happier with the gimmick after discovering that. 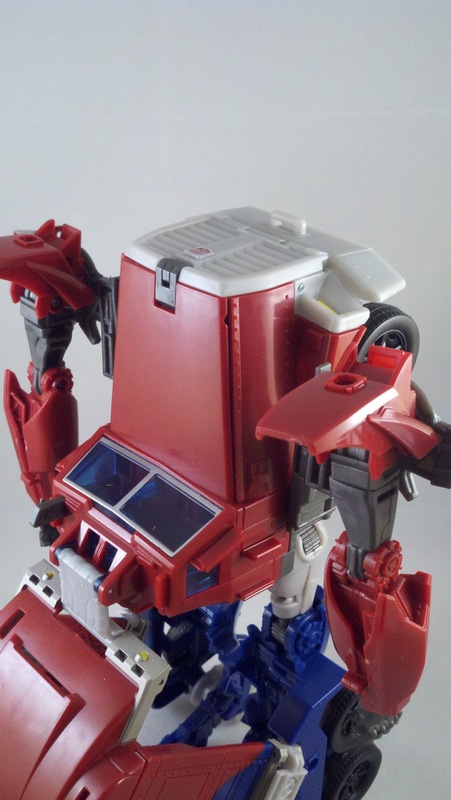 For accessories, Optimus comes with his signature Ion Blaster. 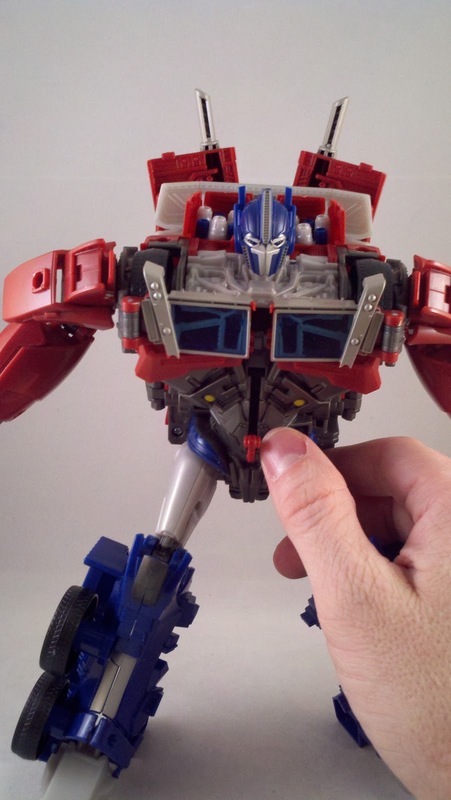 Like all other Prime figures, even though their weaponry is built in, the OPtimus is still molded with hands that hold his weapon. I felt this blaster was a little... small... for the scale of the figure. 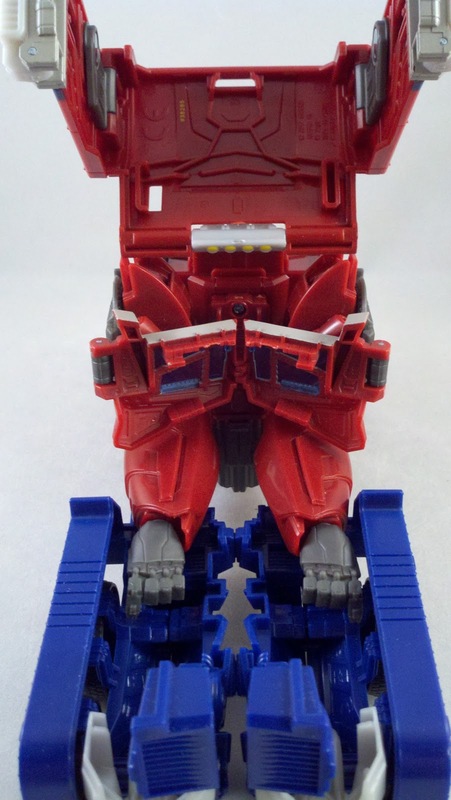 Molded in light great plastic that matched Optimus' legs... it really isn't anything special. So much so, I forgot to take pics of it on it's own. 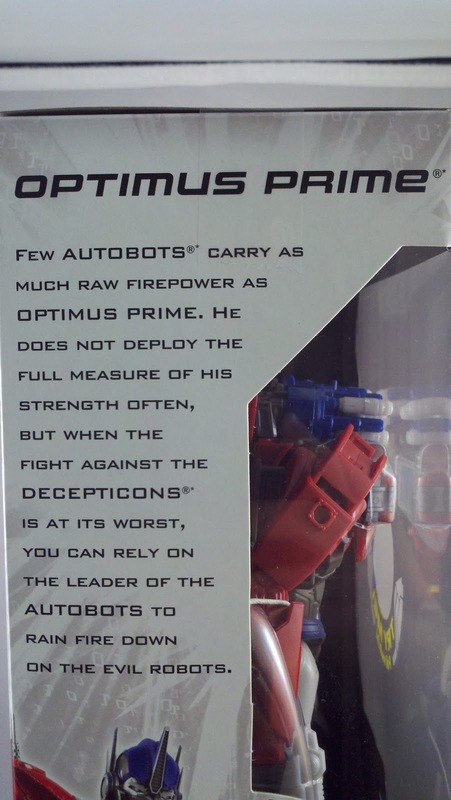 The bio says Optimus holds a ton of 'raw firepower'/... if that's the case, I think this toy should have come with 2 Ion Blasters. 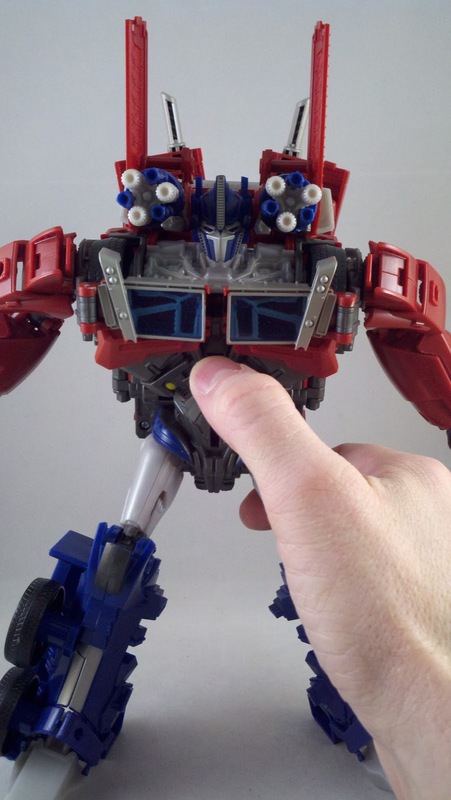 Optimus has pretty standard fare is the way of articulation. 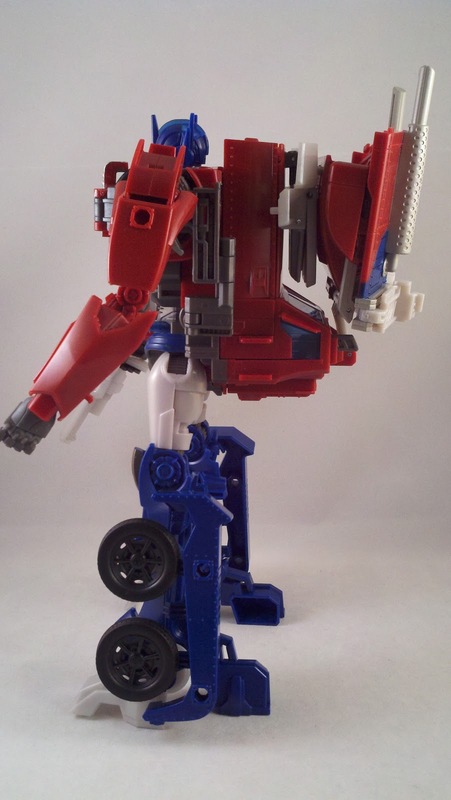 He's got quite a few hings and swivel joints placed throughout that allows him to be posed fairly decently. 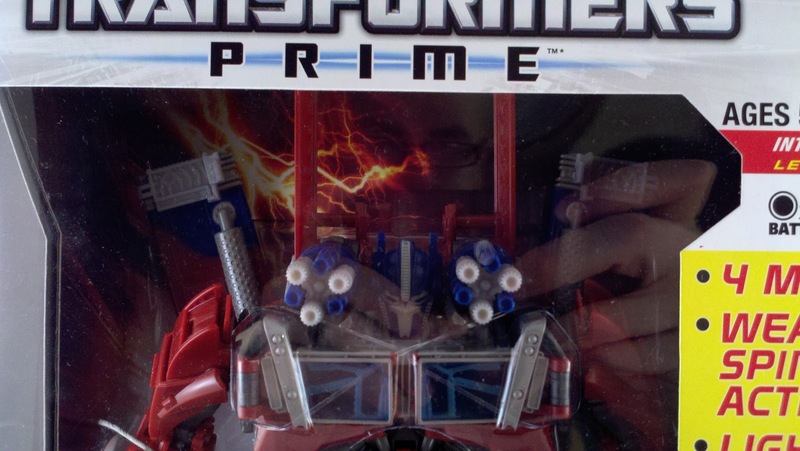 The one spot that lacks good articulation is the head. 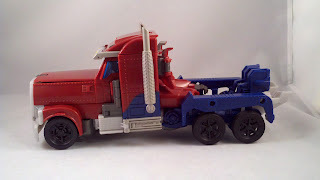 While it's on a ball joint, the neck is so short that it hinders how much Optimus can look around. Due to his gimmick, he does have quite the fair amount of back kibble. But it folds up decently so it's not a total eyesore. 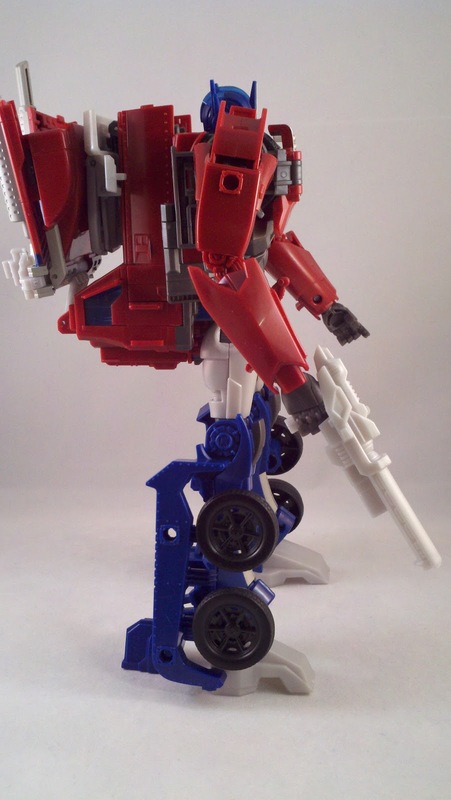 His feet also have some fairly large heels that keep him from falling backwards. 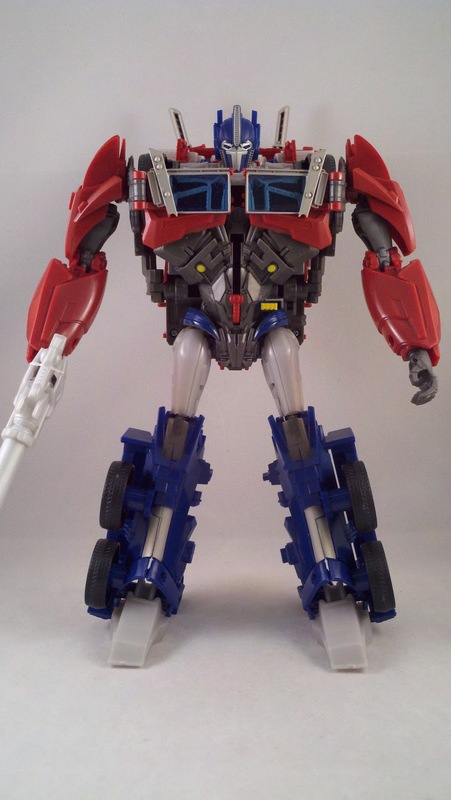 Once you get down past the knees though... it looks like Hasbro just gave up. His lower legs are very hollow. I was hoping this would be taken care of during transformation... but alas, no. 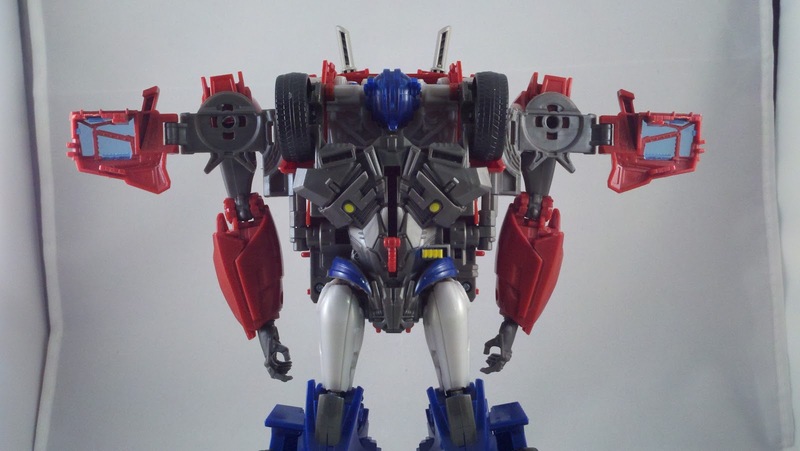 From Bot-mode, rotate Optimus' arms inward at the bicep so the palms face backwards and fold his shoulder 'pads' all the way down. 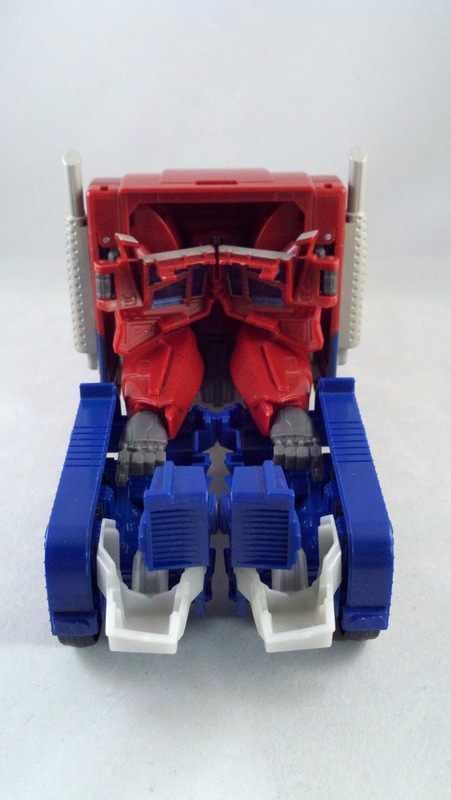 Open the chest and flip Optimus' head down. 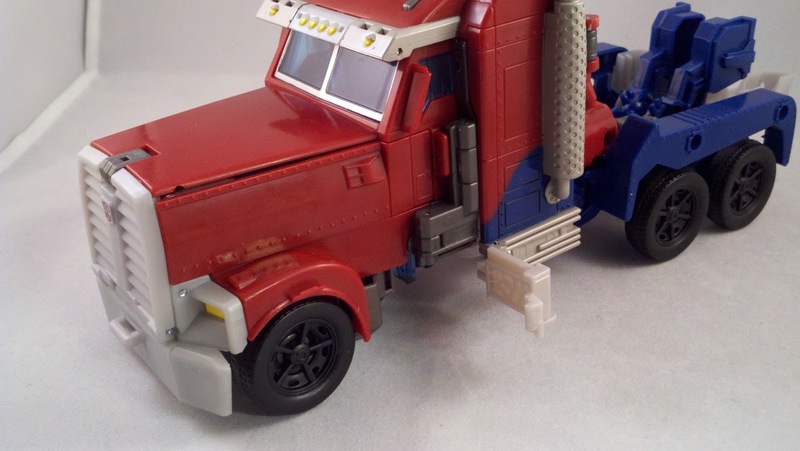 On Optimus' back, swing the rear of the cab assembly down. 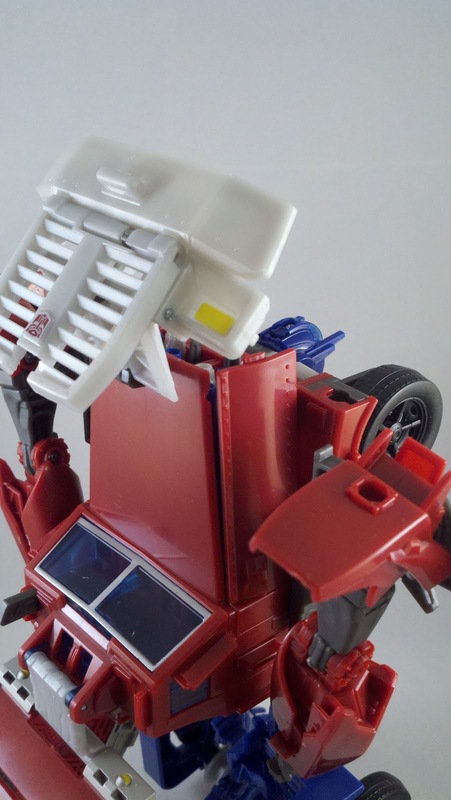 The grill of the Alt-mode swings up and over and snaps into place using tabs behind the headlights. The sleeper cab assembly unfolds and snaps into place fairly intuitively, roof and the two sidewalls. 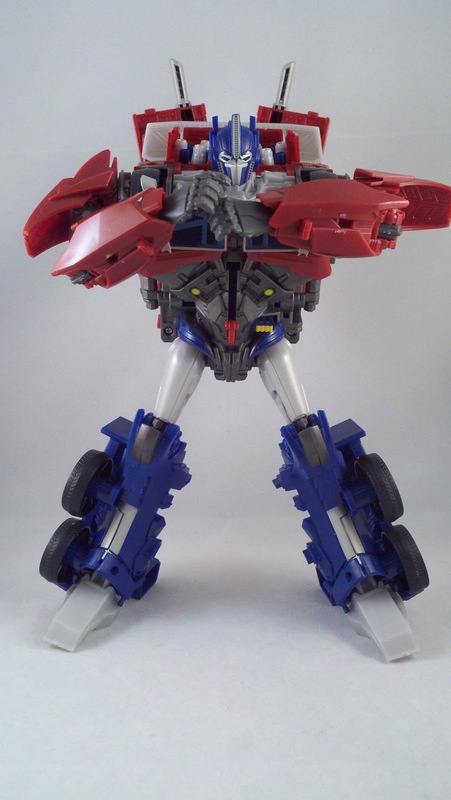 Fold Optimus' feet down and snap his legs together. The shoulders rotate down and towards the back. 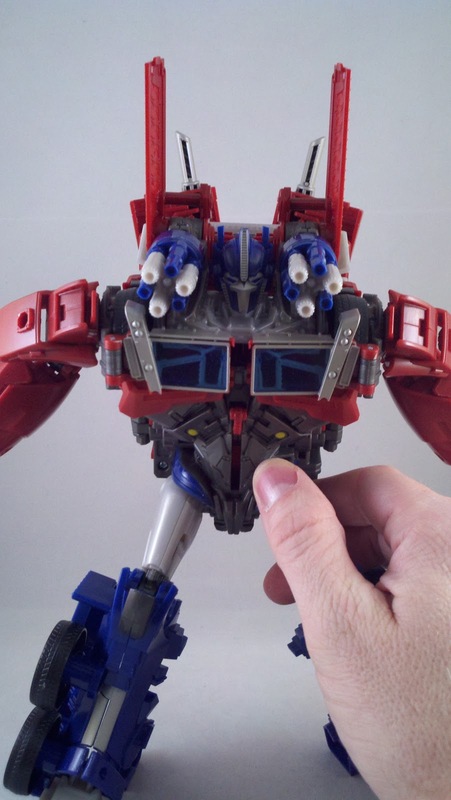 Bend the arms at the elbow and then swing the entire assembly to the back of the Alt-mode. 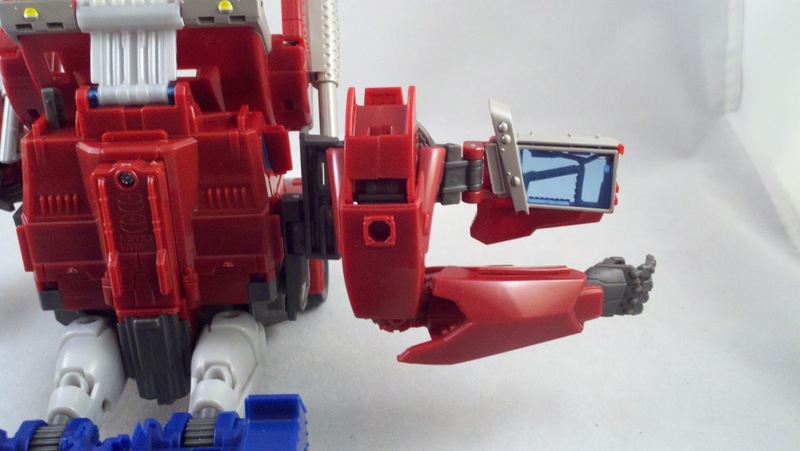 There are tabs on the bottom of the forearms that will snap into the legs. 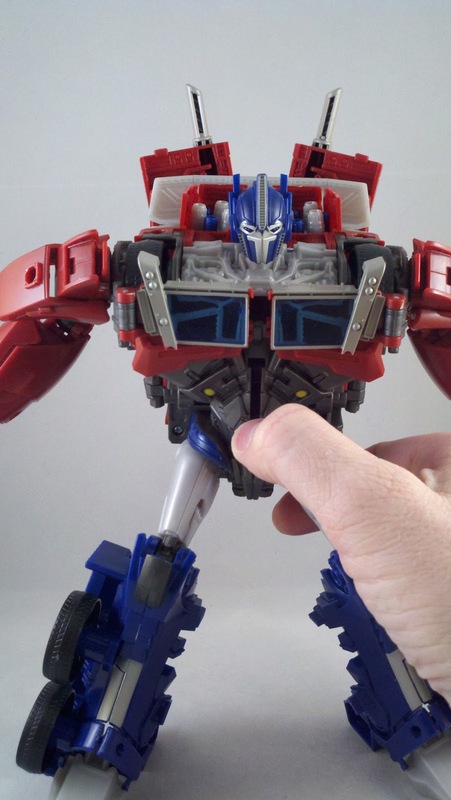 I made sure to rotate Optimus' hands so they faced palm down. The windows from the chest will fold inward and fit together, they are set so they angle inward, it's kind of odd looking. Rotate the sleeper cab assembly down and snap it into place. There are two small grey tabs at the bottom that swing out and snap into place just behind the front wheel wells. 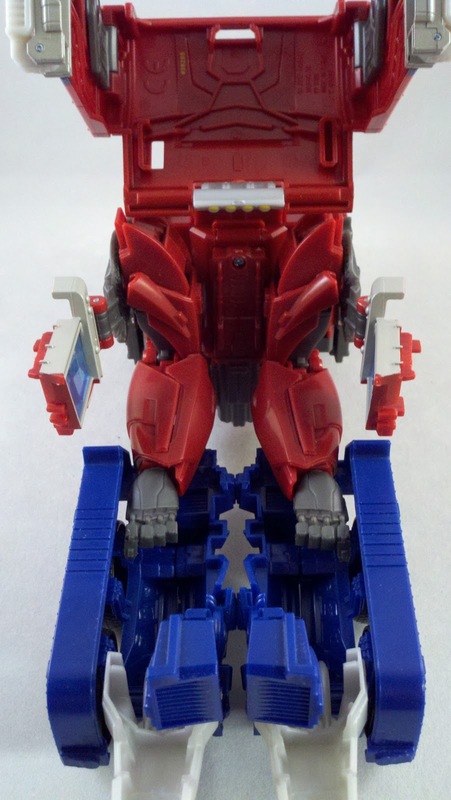 The Alt-mode isn't that bad... as long as you don't look at it from the back. 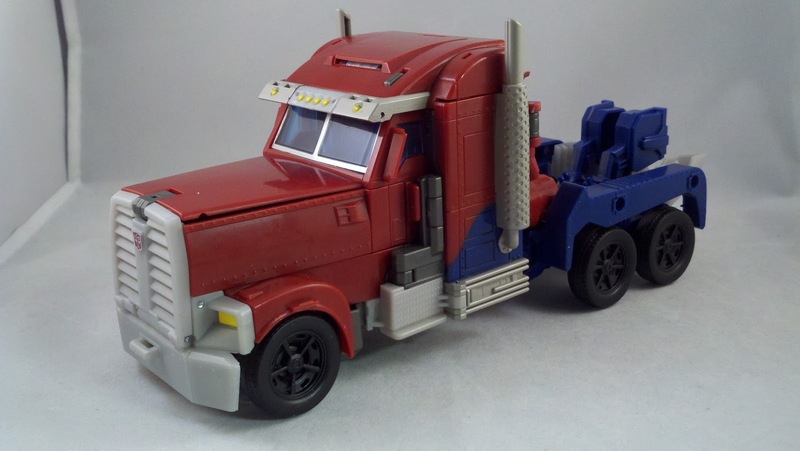 There have been jokes about the MP-10 Optimus and how the back of his Alt-mode looks to bulky to be a truck. 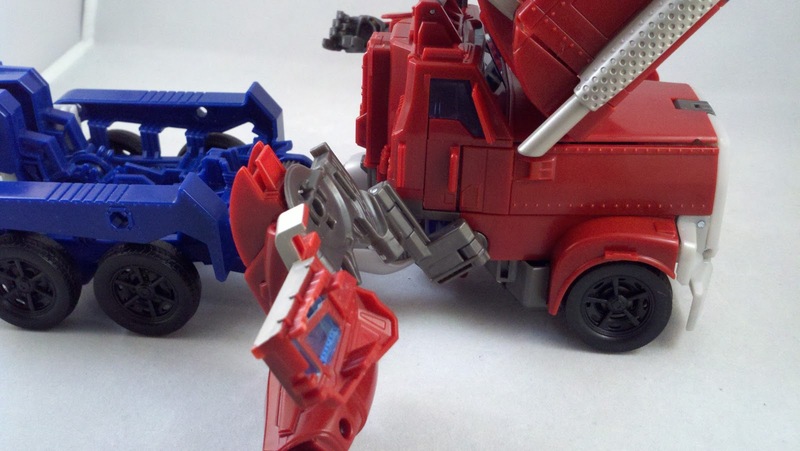 The joke on this would be along the lines of how Optimus' hands are showing and how sparse the back of the truck his. And what's with the Bot-mode heels just jutting out back there? 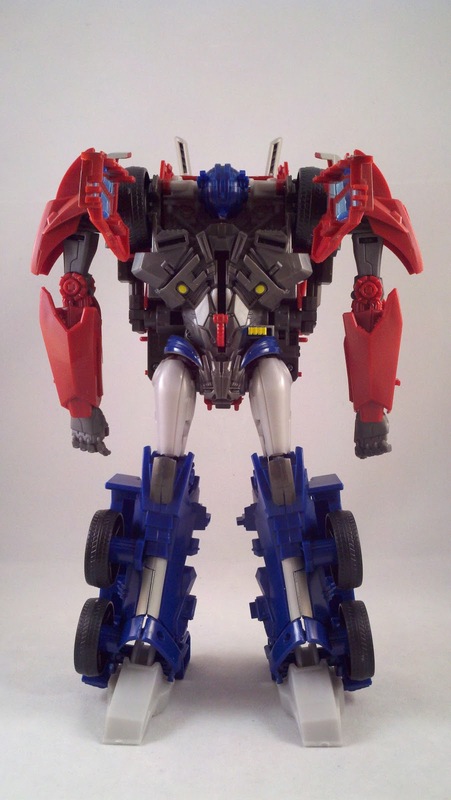 Apparently the budget for this toy went into the gimmick and to make it look good from the front because from the back, this figure's Alt-mode is just bad. Overall, Weaponizer Optimus Prime isn't a bad figure, but there are certainly spots, almost of of which are in the Alt-mode, that could be improved. 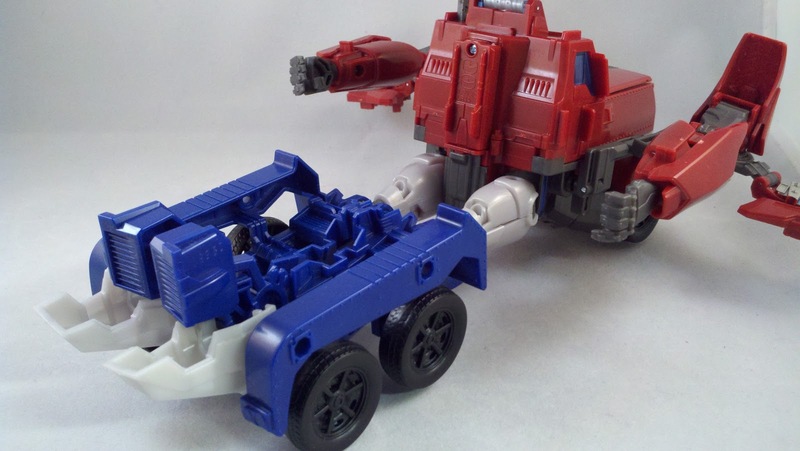 He's got a decent amount of paint, though his wheels could use a touch up. I'm just miffed about the truck... the complete lack of attention to the back of the Alt-mode is just sloppy. 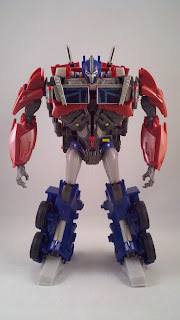 This Optimus will spend his fair amount of time on my shelf, but it'll be in Bot-mode. 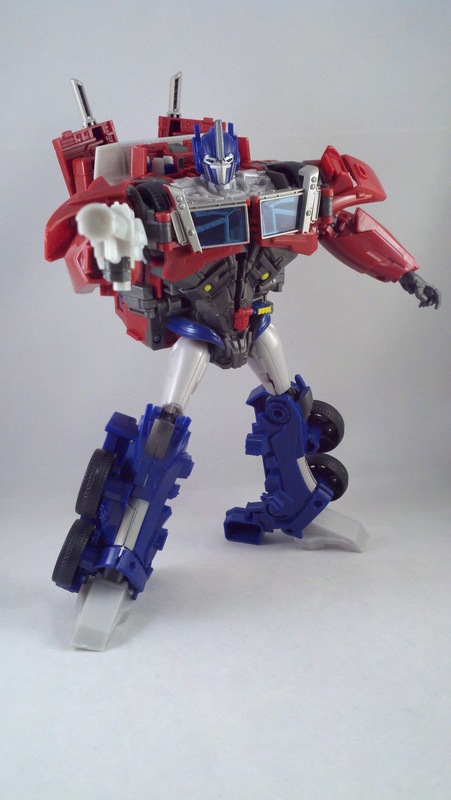 If you're like me and collect Optimus for the sake of collecting Optimus, then this figure is a nice Bot to add to your collection. 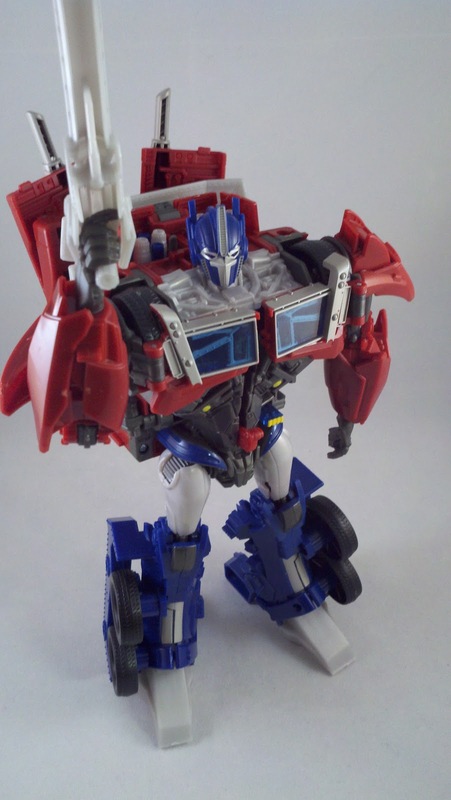 If you collect Optimus for the sake of collecting the Alt-modes, I'd display him facing completely forward, or pass on him altogether. 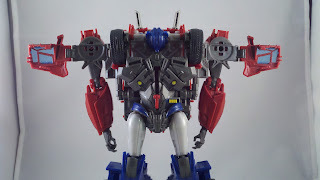 Pics, review, and slight disappointment by Scion of Primus. He's definitely a nice size. 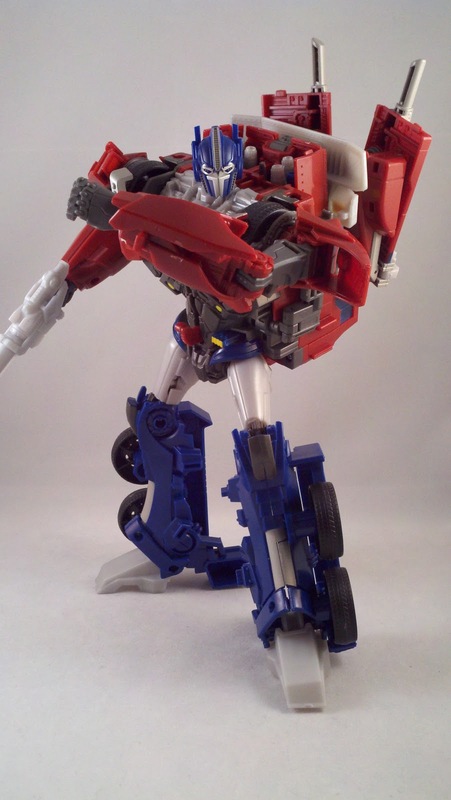 I'd say he and BB were meant to be the TF:Prime line's Leader scale figs. 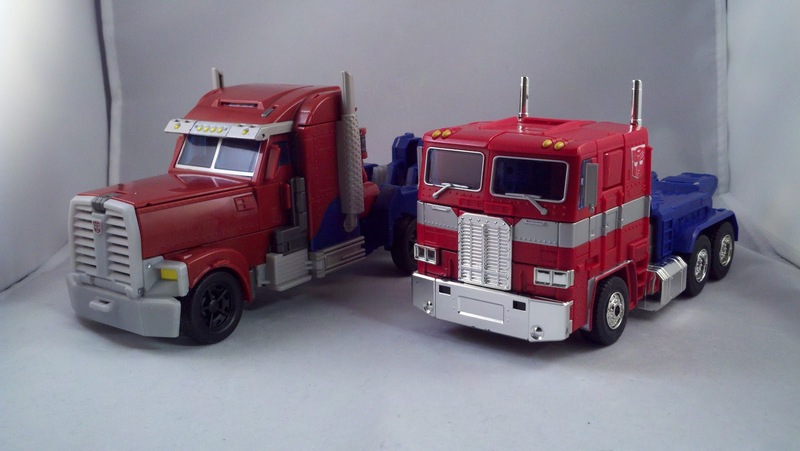 could you please let me know where i can buy weaponizer optimus prime and bumblebee now ? Is it still available in stores ? 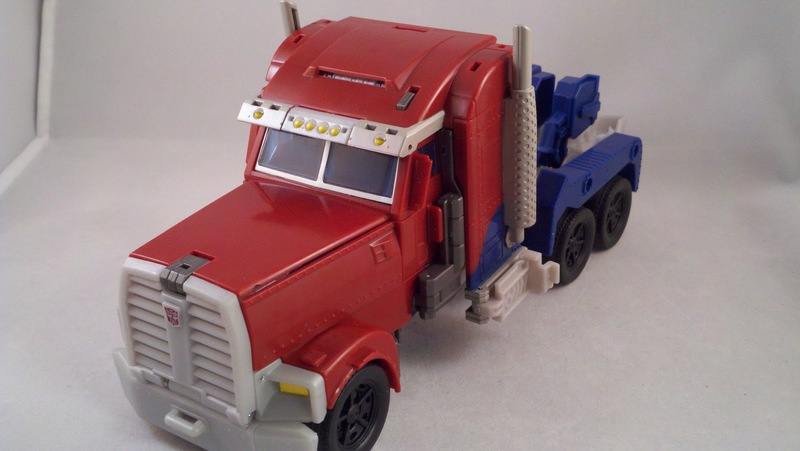 Also, he was redeco'd twice: Platinum Ultra Magnus and Beast Tracker Optimus Prime. But those would be more expensive than weaponizer optimus.